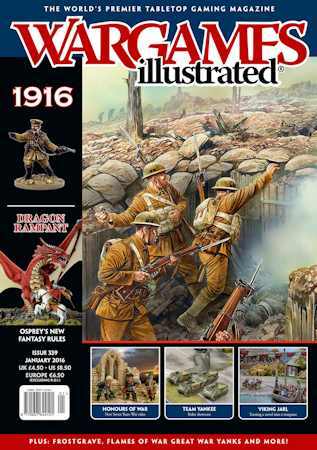 For WI339's theme, we look back 100 years to 1916, with articles featuring The Great War on Land, Air and Sea. Outside of our theme coverage, we have loads more articles, covering Dragon Rampant, Team Yankee, Honors of War, Frostgrave, Vikings, and more beside. Jim Graham provides an overview of this momentous year during the Great War, still a war of contrasts but one which began to consume more and more men and resources of the nations who fought it. Never one to rest on his laurels, Dan Mersey presents an exclusive, self-contained Arthurian-era set campaign for his new Dragon Rampant rules. James Morris tells us how a chance remark led him to undertake a thought-provoking journey to the area where so many French and German soldiers lost their lives. Steve Dake explores a problem familiar to many of us – the project that never truly ends. A straightforward, wargamer’s guide to the key naval battle for those interested in naval actions. The author of the new Seven Years War era rule set from Osprey Games talks about what inspired his creative process. As the war in Europe ground on, the fighting in the Middle East was just as vicious. Jim Graham looks at this crucial battle between a mix of warriors. How does one go about creating a slice of a ruined fantasy city? By investing in a number of tools and slicing up a lot of polystyrene in interesting ways! Although the Somme has come to epitomize many of the horrors of trench warfare, Jim Graham provides some ideas for turning aspects of the battle into a wargame. High above the mud and blood of the battlefield, an equally bloody struggle for control of the air continued to change in response to new tactics and technology. Master model maker Paul Davies presents some ideas on approaching the creation of the types of terrain found on the Western Front. The new Flint and Feather range from Pulp Figures have inspired Neil Smith to undertake some research on ways they can be used on the tabletop. The Battlefront team presents information on how to use the 369th Infantry Regiment and the US Marines using the Great War Miniatures Game. Pete Brown looks at some ways to make it easier to game aspects of large historical battles rather than busting a gut (and a bank balance).